CloudForms is an upper-layer management abstraction that allows an organization to manage private, public and virtual infrastructure seamlessly from a single-pane-of-glass. CloudForms allows you to create powerful policies and apply them to all virtual infrastructure. In CloudForms you can not only build workflows and automation but you can expose those workflows to end-users as services. You can build service catalogs and easy to consume UI forms. Finally you can collect information about all virtual infrastructure enabling chargeback, dashboard visualization, monitoring and alerting. CloudForms supports OpenStack, Amazon EC2, Red Hat Enterprise Virtualization Management (RHEV-M), VMware vCenter, Microsoft System Center Virtual Machine Manager (SCVMM) and all the virtual infrastructure those platforms provide. The CloudForms product is downstream from the ManageIQ open-source project. Red Hat is a founding member and a large contributor to this community. Before sinking our teeth into Cloud Forms it is important to understand some terminology. CloudForms allows for the management of clouds and infrastructure. Providers – A cloud provider is a computing platform that manages instances and allows building of multi-tenant infrastructure services independent from underlying hypervisors. Cloud providers supported by CloudForms are Amazon EC2 and OpenStack. Availability Zones – Logical or physical groupings of cloud resources. Tenants – Cloud computing provides a common software platform. Tenants share the platform but are completely isolated from one another. They have their own data, network and security. Flavors – Cloud computing offers infrastructure as a service. A flavor describes a specific type of instance and what kind of resources are made available to the instance. All instances are created from a type of flavor. Security Groups – Tenant based security that defines Ingres and Egres access to instances. Instances – Virtual Machines running under cloud infrastructure. Providers – A infrastructure provider is a management platform for managing virtual machines from a single type of hypervisor. Infrastructure providers supported by CloudForms are Red Hat Enterprise Virtualization Management (RHEV-M), VMware vCenter and Microsoft System Center Virtual Machine Manager (SCVMM). Hosts – Hypervisors running on physical hardware providing virtual machines and infrastructure. Clusters – Provide high availability and load balancing for a group of hosts. Clusters are groupings of compute hosts that share similar resources such as network and storage. Virtual Machines – Operating systems running under a hypervisor. Datastores – Storage locations that contain virtual images and disks. Cloud Forms is distributed as an Open Virtual Applicance (OVA). There are OVAs for RHEV, OpenStack and VMware. The CloudForms OVAs are available for download here. If you are using RHEV you can follow the importing OVAs into RHEV guide. At this point you have successfully configured the appliance and can now connect using your web browser to https://hostname. CloudForms is an appliance so after installation all management will occur through the web-based management portal. In order to start doing things with CloudForms we need to configure users, enable automation and add providers. Connect to CloudForms management portal as user: admin password: smartvm. 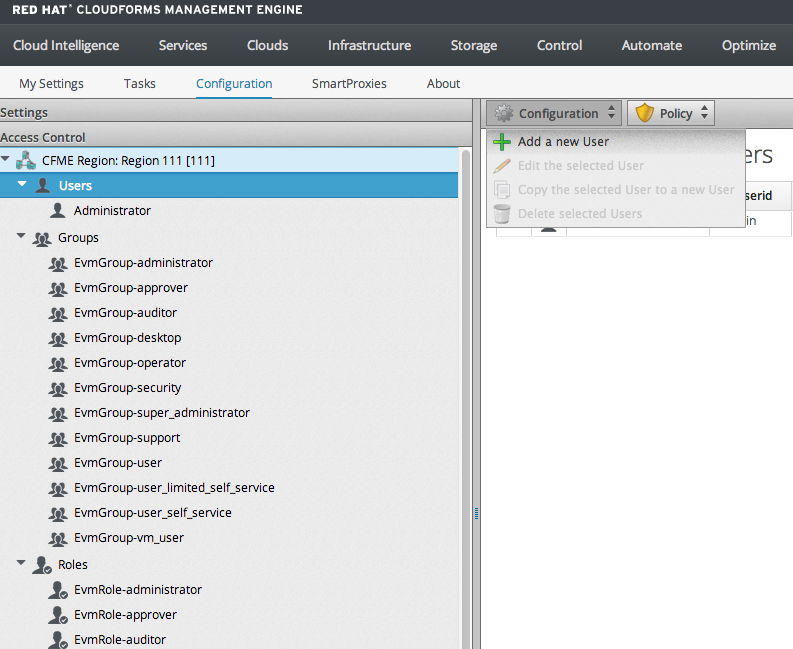 By default CloudForms will only create the administrator user admin. 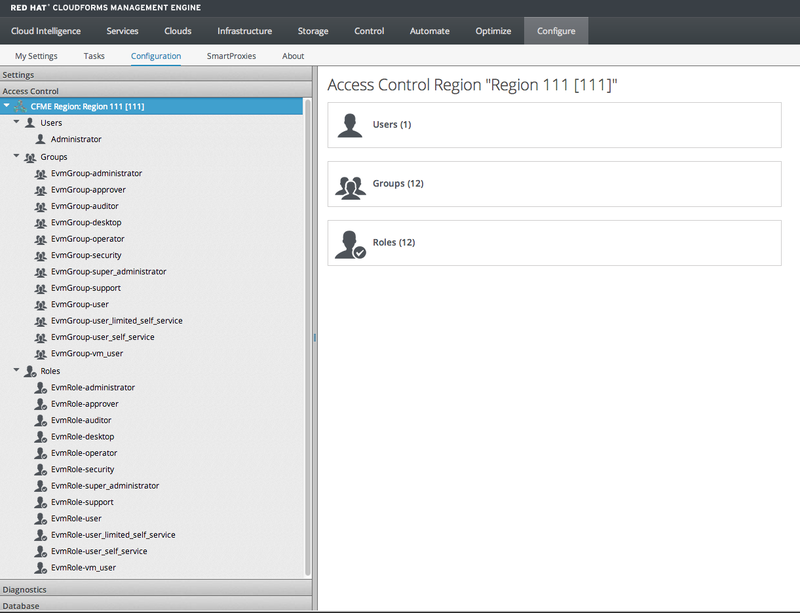 New users can be created under “Configure” -> “Configuration” -> “Access Control”. Here we can add users, groups and roles by simply selecting one of them and “Configuration” -> “Add new”. CloudForms has a lot of capabilities, one of them provisioning, requires automation to be enabled and by default it is not. Provisioning will allow CloudForms to create instances or virtual machines on the infrastructure that it is managing. 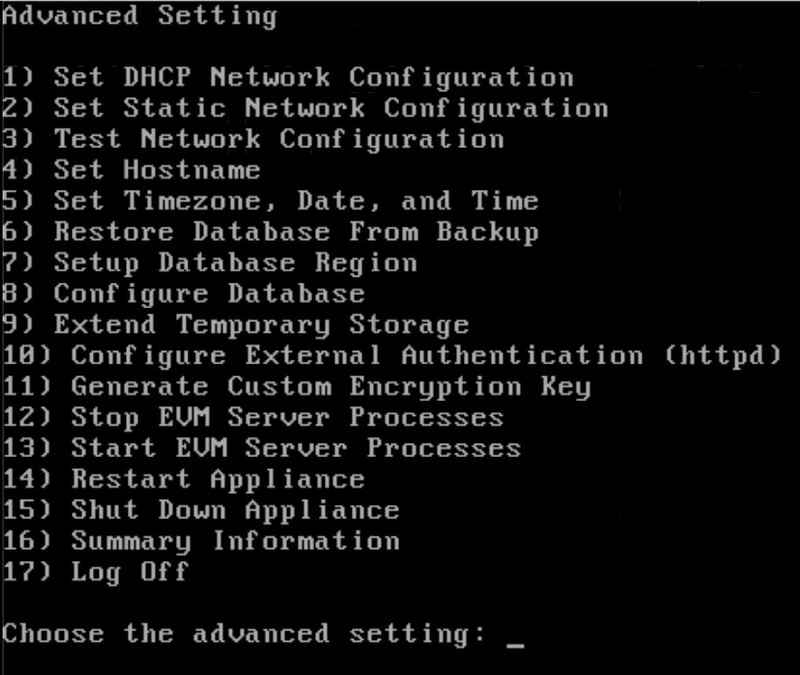 In order to enable automation and as such provisioning navigate to “Configure” -> “Configuration” -> “Settings. 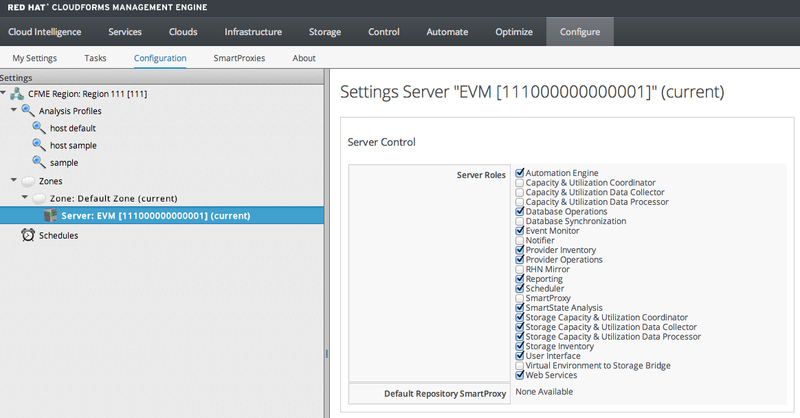 Under “Zones” -> “Zone” select the CloufForms EVM server. Enable the “Automation Engine” and save. In order to manage cloud infrastructure a provider must be added to CloudForms. Under “Clouds” -> “Providers” select “Add a new Cloud Provider”. In this case we will add a OpenStack provider. Before adding provider make sure you validate credentials. 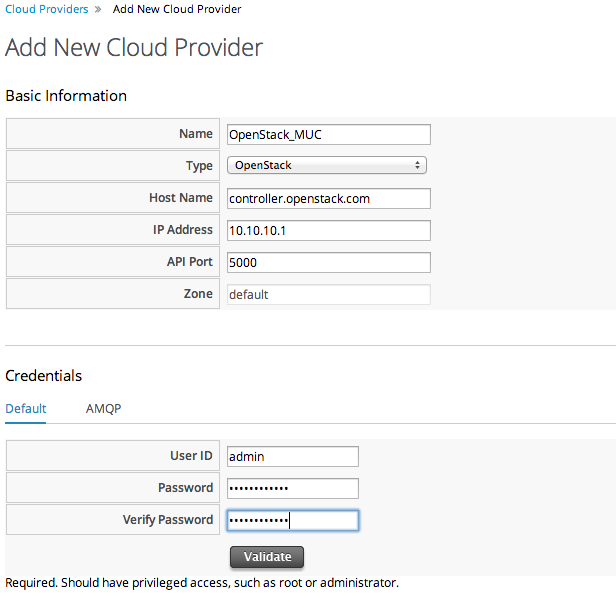 Validation tests if CloudForms can communicate with the provider using the given credentials. CloudForms will let you add a provider regardless of if communication is working. In order to manage virtual infrastructure an infrastructure provider must be added to CloudForms. Under “Infrastructure” -> “Providers” select “Add a new Infrastructure Provider”. 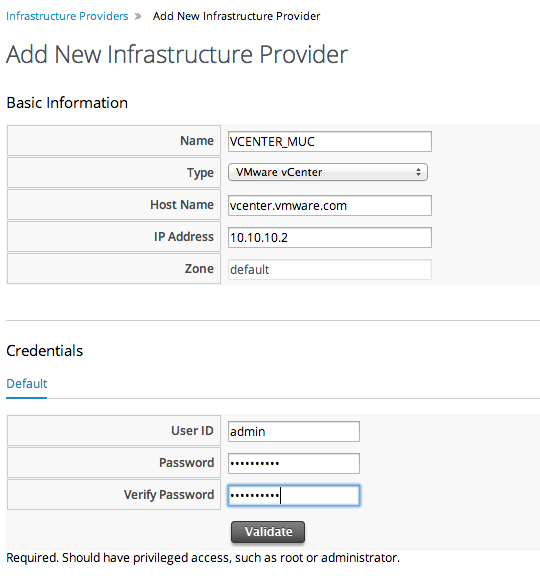 We will add a VMware vCenter provider. CloudForms provides instance or virtual machine life-cycle management. The idea is that a workload has a life-span and during its life will run on different infrastructure. It could be on private cloud infrastructure such as that from Red Hat, VMware or Microsoft. It could be on public cloud infrastructure from Amazon EC2, Cloud Service Provider running OpenStack or your own OpenStack private cloud. CloudForms lets you seamlessly manage your entire virtual infrastructure with policies and powerful automation engines. As we move into the future it is clear the hybrid cloud will prevail and become increasingly important. The idea of workload life-cycle management and moving workloads effortlessly across different infrastructure management platforms will become the norm. The whole concept of a workload life-cycle is new to many organizations. We are used to provisioning new environments but decommissioning them is something that occurs far less frequently. We need to change, infrastructure isn’t built forever, it is built for now and when the time comes workloads must be decommissioned or moved to new infrastructure seamlessly. Beyond that, our various cloud or infrastructure platforms must be controlled or governed by central policies. Finally provisioning must be completely automated through one-click end-user service catalogs. This is what CloudForms is all about. CloudForms is taking huge strides to satisfy these needs and become the upper-layer multi-cloud management leader. Hopefully this post intrigues your interest to investigate this topic further. Keith, very nice article, it adds some very important information that is missing in the install manual. One thing though, I have installed this several times, and every time, I cannot access the Horizon URL immediately. I have just completed an install, and although everything looks good, and nmap shows port 80 open, I cannot connect to it from any browser, on any platform on any network. About Horizon it takes a bit to become available. The underlying OpenStack services can take a few minutes to start and Horizon wont display anything till all OpenStack services are up. To be sure make sure firewall is off ‘systemctl disable firewalld’. You can troubleshoot and see if it firewall issue by doing a ‘curl http://localhost:80‘ from the OpenStack controller. I know this is obvious but it got me few times is that browser often caches when you cannot connect because OpenStack hasnt started so clear the cache. Finally on the OpenStack controller do an ‘openstack status’ or ‘openstack services status’ cant remember exact command to check all the services and ensure things are working. Hope this helps, BTW you posted this in CloudForms so if you are referring to that let me know? After i have installed cloudforms4.1 and discovered openstack overcloud in cloud provider tab with admin credetials i am only able to see instances related to admin user and not all tenants and also i am not able to create new tenants. Appreciate any kind in inputs in this regards. Hi Ravi are you sure your admin user has admin permission and also heat stack admin role? It sounds like the admin is only admin of tenant.